The first official photos of the Aston Martin DBX are out, confirming the upcoming sports crossover’s name and hinting at a funky, hunky and definitely polarizing look that will probably rake in tons of cash. Of course the Aston is still very much an Aston, borrowing a lot of similar modern styling cues from the new DB11 and Vantage, of course. I have to say I love the “hip” over the rear wheels, and the curved bodywork separating the shoulder of the car from the greenhouse. Compared to the concept we saw a few years ago, the production-prototype DBX has grown a set of doors, seemingly lost the DB11-style roof accent piece, and become much more pedestrian, but that’s to be expected. 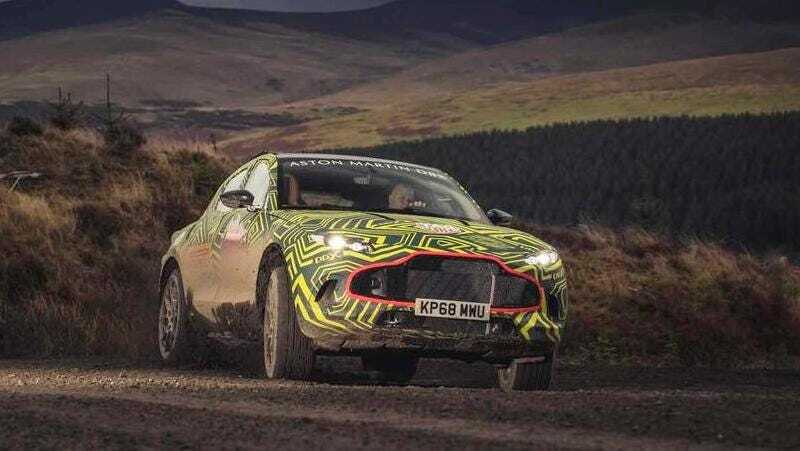 Anyway, we know that the DBX is Aston’s first crossover, and according to Autocar, these images are seemingly supposed to prove that the company is at least trying to make it somewhat off-road or soft-road capable. We also know this the DBX will be the gateway to future hybrid Astons, and the platform will be the basis for the upcoming all-electric Lagonda lineup. Aston is trying to position the DBX has some sort of big-GT car thing, which is fine because words don’t matter anymore. I’ve accepted it. At least it looks like an Aston Martin.